In central Nigeria, clashes between predominantly Christian farmers and mainly Muslim Fulani herdsmen reached another peak in Plateau over the weekend, as suspected herdsmen went on a killing spree in a dozen villages, leaving scores dead. Early reports suggested that 86 people were killed, but local sources contacted by World Watch Monitor said as many as 200 had been killed by Sunday evening in the violence, which began on Thursday. Some fear that the toll may be even higher, as more bodies are yet to be recovered, while others were burned beyond recognition. The violence forced the state governor, Simon Lalong, who was attending his All Progressives Congress (APC) National Convention in Abuja, to cut short his stay and return to Jos, the state capital. President Muhammadu Buhari, who is seeking a second term in the coming 2019 elections (due in February), was also attending the convention. Back home on Sunday, Lalong imposed a dusk to dawn curfew on Riyom, Barkin Ladi and Jos South, the three affected local government areas, in an attempt to curb the violence. However, World Watch Monitor has been told that the violence continued, with more villages coming under attack on Monday night. President Buhari, criticised for his perceived ‘lukewarm’ attitude towards the ongoing Fulani violence in the country, condemned what he called “painful” and “regrettable” killings and expressed his “deepest condolences to the affected communities”. On Monday, he dispatched his Vice-President, Prof Yemi Osinbajo, to convey his condolences to those in Jos and assess the situation on the ground. The president himself visited the following day. 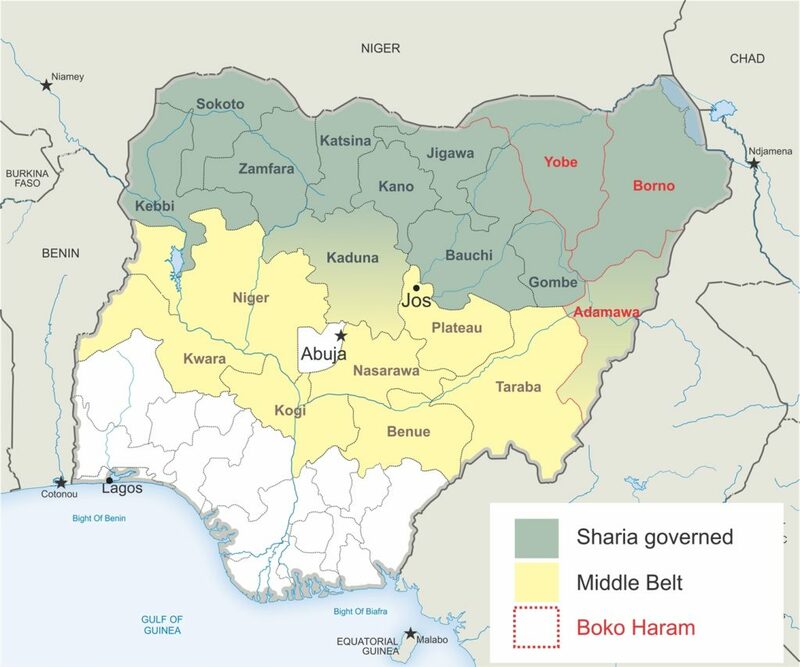 Nigeria, the most populous African country, is divided along ethnic and religious lines. The central state of Plateau is located on the fault line between the mainly Muslim north and the Christian and animist south. After violence resumed in Jos in September 2017, analysts warned that trouble in Jos had the potential to upset the relative calm that had recently prevailed in Plateau, with potential consequences reaching far beyond. Jos is seen almost as a miniature Nigeria, comprising almost all ethnic groups, but actually dominated by three predominantly Christian tribes (with the headquarters of many Nigerian Churches in Jos); analysts warned in September that a disruption to the peace in Jos could in turn affect the entire nation, and especially the Christian community in Nigeria. Buhari also announced an unprecedented deployment of security forces in the region, including two police surveillance helicopters, five armoured personnel carriers, three Police Mobile Force (PMF) units, two Counter-Terrorism Units (CTU) and Police Intelligence Units, and conventional police personnel from other states. But for many, particularly among the Christian communities in the Plateau and other Middle Belt States like Benue and Nasarawa where Fulani militias have been causing havoc, there is a feeling of déjà vu. The weekend violence was the latest episode in a series of attacks targeting predominantly Christian communities in the state. It brought back memories of the March 2010 attacks when more than 500 people were massacred by herdsmen in Dogon Na Hauwa, the worst such incident in Nigeria’s recent history. In March, Buhari visited Plateau to launch the state’s Roadmap to Peace, and to express the federal government’s commitment to support Plateau to achieve peace. Ironically, while the president was still in the state, the Fulanis attacked communities in Daffo – which was also one of the areas attacked over the weekend – and also in Bassa, which was attacked shortly after Buhari’s departure to Abuja. Scores were killed during the March attacks, as World Watch Monitor reported. Between 2010 and 2012, Plateau was the epicentre of the sectarian violence in Africa’s most populous country, but in the next five years the state even became known as a model state as violence decreased. However, since September last year, the violence has resumed with repeated attacks against Christian communities. It has escalated further this year, particularly in Riyom, Barkin Ladi, Bassa and Bokko local government area. For instance, Bassa is still under curfew following the previous violence in March. Is it right to describe them as ‘farmer–herder clashes’? The Christian Association of Nigeria (CAN) has condemned the latest attacks and denounced the rhetoric painting the killings as simply “farmer–herder clashes”, with predominantly Christian farmers from the Berom ethnic group reported to have instigated the recent violence by stealing cattle. “The killings are becoming no longer herder and farmer clashes” but a “deliberate attempt to conquer and occupy the land of the people’s ancestral heritage,” said Bewarang, who also denounced the attack on a Bible school that trained African missionaries, locally known as CAPRO School of Missions (SOM), in Gana-Ropp village. In his address to leaders of farmers and Fulani communities on Monday, Vice President Yemi Osinbajo denounced the manner in which people are being “mercilessly” killed in Plateau, and pledged that the federal government will bring the perpetrators to justice. “The federal government is here not only to restore peace, but to also ensure there is peace,” he said. Information from the affected areas is still sketchy, but details gathered by World Watch Monitor have revealed the scale of the attacks, with some 120 people who attended the funerals of an elderly member of the Church of Christ In Nations (COCIN) hacked to death as they returned home. In another attack, in Gana Ropp village, the pastor of an Assembly of God church, Rev. Musa Choji, was killed, as were his wife and son. In Gidin Akwati, the whole community was burned down. Some of those displaced are still hiding in the bush, as they haven’t yet been able to find their way to a safe haven, a local source told World Watch Monitor. In response to the allegations of revenge attacks by herdsmen, the source said: “This has always been the case in such situation. Each time the Fulani want to attack, they will move their cattle and destroy people’s farm lands. And when people react, they will distort the truth and the flow of information. 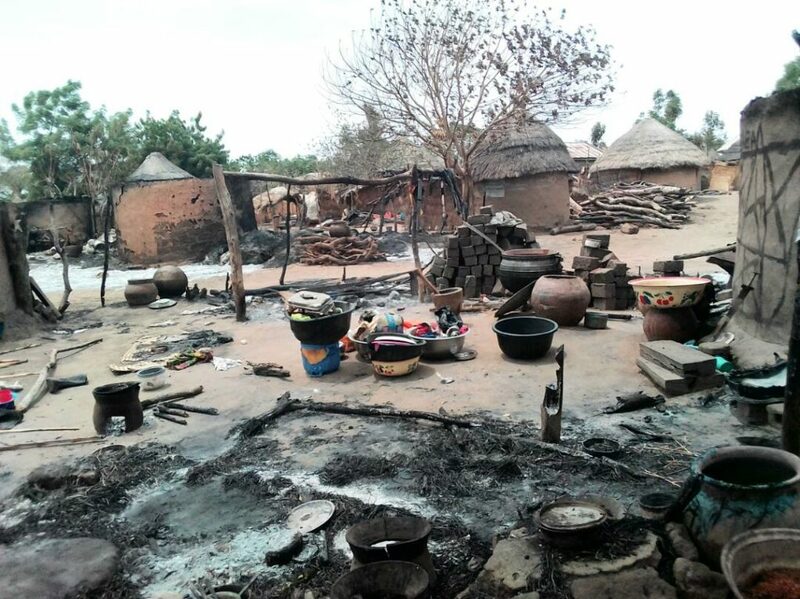 A pastor with the Evangelical Church Winning All (ECWA) denomination, who wanted to remain anonymous for security reasons, told World Watch Monitor that his entire village was reduced to ashes and more than 100 people lost their lives following an attack on Saturday. He said more than 50 heavily armed Fulani herdsmen surrounded the village of Nghar, in Gashes district, at around 3.30pm. They burned down all the houses, as well as two churches. Only a few people were able to escape. His wife’s family was decimated: the assailants killed 14 members of her family, including her mother and sister. Others who had come to visit them were also killed. In total, 27 people lost their lives in the same house. They were all burned to death. Only one person – his wife’s younger brother – survived, as he managed to escape through the roof. On Sunday, 75 of the victims were buried in a mass grave, some of whom were burned beyond recognition. World Watch Monitor also learned that on the day of the attack in Nghar, only two soldiers and one policeman were in the village, but they reportedly ran for their lives when the herdsmen launched their attack. The pastor also denied that the herdsmen were acting in revenge. “We’ve been living peacefully with them. Since this crisis started in Plateau in recent months, our people have not killed one Fulani man. Instead, they have been killing our people one by one. We just buried them and carried on,” he said. As a result of the ongoing insecurity, there are places where people can no longer go to farm, he said, “because when they go, the Fulani will come and put their cows, or attack them”. “Just two weeks ago, they shot my wife’s young brother. But thank God he survived and we had to take him to the hospital to get the bullet removed. He was discharged on Wednesday and he returned home on Thursday, only to get killed in the last attack, on Saturday,” he said. 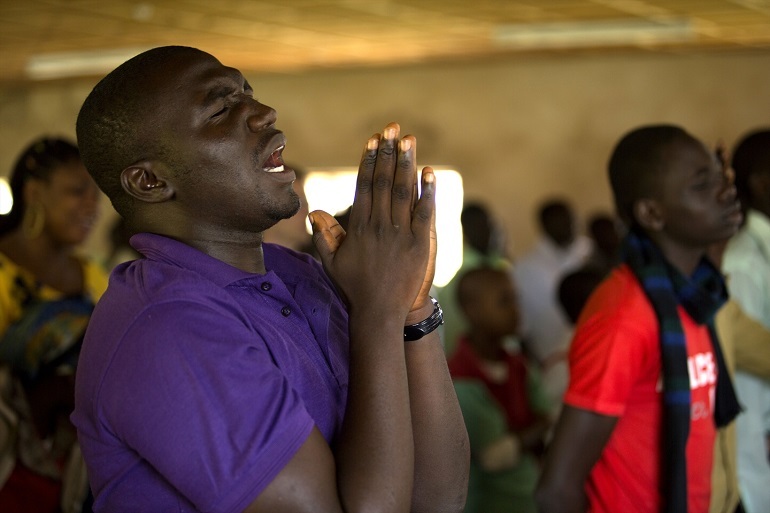 Pastor Steve Kwol, Chairman of the Pentecostal Federation of Nigeria (PFN) for Plateau North, which includes the areas affected by the recent killings, told World Watch Monitor the violence in the area has been going on for the last two weeks. He said the herdsmen were ambushing people going to farm or travelling on their motorbikes and that the violence reached a peak over the weekend. Since Thursday, the herdsmen had launched “very serious attacks” on the whole communities, he said, which continued unabated throughout Friday, Saturday and Sunday. And despite the current curfew, and the presence of military, the attacks are still ongoing. He said two villages – Kwi and Dorowa – were badly damaged on Monday. In Dorowa, most of the properties were burned down, including four church buildings. The adjoining buildings, such as pastors’ houses, were also burned down. In Kwi, a number of buildings including churches were also set alight. The exact number of people killed there is not yet known, but many were displaced and are now living in camps in neighbouring villages. The original version of this news report, published 28 June 2018, included a “statement” attributed to Danladi Ciroma, chairman of the Miyetti Allah Cattle Breeders Association of Nigeria, the main Fulani advocacy group, in which he characterized the 23-24 June attacks as “retaliatory” for a series of thefts of livestock from the Fulani herders. However, the Abuja-based Premium Times reports that the statement cannot be authenticated. The news organization said the purported statement was supplied by a pool reporter in Jos, but that no statement had been issued by the breeders association and no recording of the interview existed to authenticate it. World Watch Monitor has removed the statement from this version of the story.